As my first novel is about to hit bookstores, people are asking why I invested my time, slumped over a keyboard, pursuing this or any project for nine years of my life. In response, all the usual reasons roll off my tongue—”Writers have to write,” “I had a compelling story to tell,” “I need to be able to afford baby gifts for my grandkids.” But while wrestling with the question, a deeper reason emerged: I did it most of all to make my parents proud. That’s weird, I thought, the moment the notion came to mind, since, as a kid, I nearly always felt they were proud of me. In addition, they died years ago. Why on earth would I still be seeking their approval? Ah, right, I’m a psychologist. I know about these things. At least I’m supposed to. Even when our parents are no longer with us, we still look for their love and yearn for their approval. 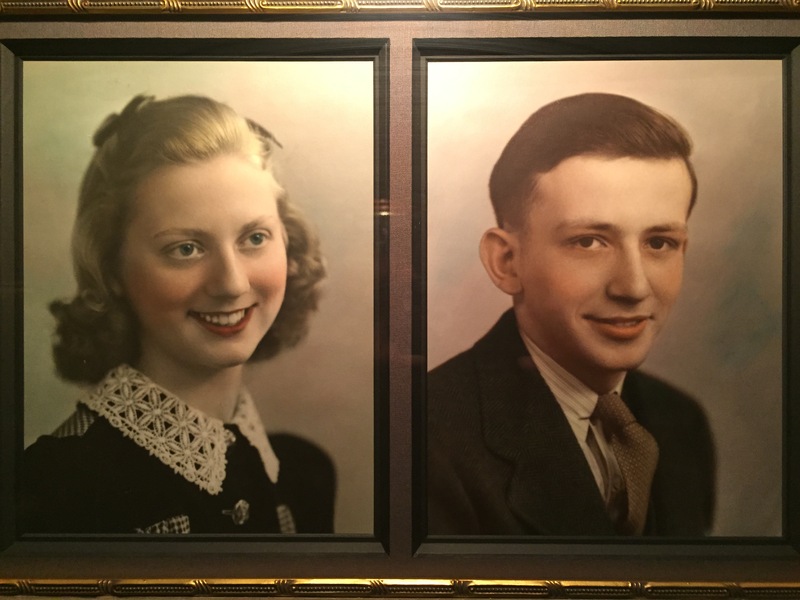 My parents, Ruth and Ralph Hallenstein, were journalists and very good writers. What they wrote were headlines, news copy, articles, and columns. Neither ever got around to writing a book—not for lack of desire, but rather for lack of time. I was luckier, I guess. Being self-employed, I was able to structure my time to great advantage. My dad was my first mentor, teaching me about writing—mostly about what to avoid. He coined the term: “repetitive redundancy” to refer to words or phrases used together that mean precisely the same thing. “Like what?” I once asked. “‘A frighteningly terrifying nightmare,’ ‘A stunningly resplendent day,'” he answered. “Those are repetitive redundancies. Pick one word or the other. Never both.” It became a family game and source of great amusement to be the first to spot repetitive redundancies in daily newspapers and popular magazines. As proud as my parents were of my brother, Blair, and me, I feel certain we were prouder of them. Both were smart. Both were newspaper editors. And both were progressive in their thinking and politics. I saw in my dad a man who never got sucked in by the crowd, but thought things through independently, figured out his truth, and stood his ground. I saw in my mom a woman who cut to the core in every interview she conducted, asking the questions others avoided—at the same time showing compassion toward everyone she met, greeting the world with an out-sized heart. Romeo was so right when he told Juliet “Parting is such sweet sorrow.” After almost 18 years, we, too, must say good-bye as we leave you. It won’t be easy when we close your doors for the last time, for you have sheltered and loved us well during these many years we have shared our lives with you. It was love at first sight when you entered our lives. Do you recall at the end of the day when we moved in how I exclaimed, “I will NEVER move again!”? But “never” is a long time and no one should really use that word for lives and needs change. I still love the way you look sitting so regally on the terrace of that corner lot with your brown aluminum siding and white trim. No, you’re not palatial nor even the most handsome, but you are ever so pretty. You’re not just a house, of course, but a home. You’ve heard those words many times as guests came through your front door and saw the lovely open stairway, the charming living room with its colonial fireplace and the dining room with its colonial corner cupboards. What fun it was furnishing you in Early American! Because we loved you so much, we couldn’t let you grow old and sag, so we gave you a face-lifting occasionally, which we know pleased you. Your basement became a beautiful recreation room with its big stone fireplace, its teakwood walls, corner built-in seat and bar which drew our guests like magnets when we entertained. The kitchen took on a new look with new counters, sink and appliances. Also an addition was built, a patio installed, bathrooms remodeled, and, of course, your new siding made you gleam for all the world to see. How your walls resounded with laughter and the voices of children and music over the years. And, too, you sheltered us in times of problems and sorrows. I tried to think of any real unhappy time, which being human we must have had, but strangely I couldn’t think of any. Apparently it was overshadowed by the fun of raising two boys within your walls. The boys were 4 and 1 ½ when you took us in, so neither of them remembers any other home. And it was through your doors they both left for college and a year ago one left as a bridegroom. There have been only two times when I couldn’t wait to leave you or stalled returning to you. The first was the morning after we took our older son to college and I had to look at his empty room. I was never so glad to get away from you and to a job, but in a few days we started adjusting to having only our younger son at home. Last fall, he, too, left for college and the next day his father and I went to dinner and stalled and stalled before returning to you because we hated to face the fact of another empty bedroom. Suddenly you were too big for us and no one really had the time to take care of you. Since we can’t take you with us to DuPage County, we have to give you up to strangers who we can only hope will love you as we have. While you have to stay behind in Aurora when we move to Wheaton in a few weeks, we will take something of you with us—memories. Yes, memories of kids and toys and parties and gales of laughter. And memories of quiet days and peaceful evenings on the patio or porch in the warmth of summer, or in front of one of the fireplaces when the winter wind howled outside, muffled from the inner warmth. Through all the years we never left you on a Christmas eve for everyone agreed you had a beautiful living room—prettier than a Christmas card with your tree lights, candles and fireplace all aglow. And looking back there were so many friends, relatives and later girlfriends who joined us on those special nights. Now, except for an occasional weekend when one of the boys comes home, you are silent. Adults don’t make much noise and are seldom with you anyhow, and even the aging dog barks very little now. Already you are starting to look different as things are sorted and boxes are packed. It won’t be the same without you and our wonderful neighbors, but Wheaton is a good city and we expect to be happy there. You have known all four of us, and known us well, and you have kept not only our faith but our secrets, too. We don’t expect to meet your kind again, but we would not trade a moment of the happiness you have given us. Now it is time to leave you, and you’ll have to forgive us if we hide a tear or two and refuse to take that one last look back which could unleash a flood. Instead we are going to smile and look ahead, just as you will smile upon those strangers turning into your driveway. I remember this house! Or maybe I remember all of the love and laughter. We were always excited to visit, that is clear to me. Thanks for the memories and giving us a chance to “feel” both your Mom and the house again.